This phrase guide is published by Prolog, an Israeli publishing company that for the last 25 years has specialized in Hebrew self-learning courses for French speakers. We are now offering the application version of the best and most popular series of its kind for teaching Hebrew to French speakers. Its new and one-of-a-kind features make learning and speaking even easier and more enjoyable! And best of all, by touching a line of text, you can listen to a fluent narration of the Hebrew translation. Horizontal Positioning: Turning the device horizontally lets you view and enlarge the sentence. By touching the screen, you can scroll through the sentences and listen again to those you select. Transliteration: As in all of Prolog's phrase guides, here too you are provided with transliteration along with translation into French. The Hebrew text is written in red Latin letters to make it easier for you to pronounce the Hebrew sentence. For example, the Hebrew word for "father" is written as "abba." User Guide: The detailed User Guide includes a summary of the main features of Hebrew, including grammar and pronunciation rules. This phrase guide is designed to serve as a basic and simple communication tool for understanding and speaking Hebrew. It includes a selected vocabulary of around 2,000 words as well as the expressions and concepts we believe are most useful for French speakers. The application is divided into topics taken from everyday life, making it suitable not only for tourists to Israel but also for all those interested in understanding and expressing themselves in basic Hebrew without having to delve into the fundamentals of Hebrew grammar and syntax (at least at this stage). Keep in mind that a phrase guide is not a dictionary and therefore does not always provide a literal translation. The purpose of a phrase guide is to clarify what the speaker is saying. That is why the translation into French is not necessarily a literal translation of the Hebrew, but rather a word or expression whose intention is comparable or identical in the given context. 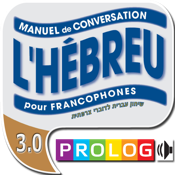 ♥Look for our other courses and dictionaries for teaching Hebrew to French speakers, or visit our website: www.prolog.co.il. Good luck!